The Judd Apatow produced comedy, "The Five-Year Engagement", includes some blatant 9/11 reminders. In one part, the main character opens up a taco shop called "9-1-YUM" run out of an ambulance. In another scene, a psychology professor is lecturing students on making bad decisions, then triggers a fake fire alarm, convincing the students to stay so he can prove his point. Firefighters are shown running up the stairwell behind the students, when it is revealed that "the firemen are not real, they are actors". A character is trying to book a location for a wedding reception, but is told that her preferred spot is booked for three years, "unless you want to get married on September eleven". Judd really Apa-tows the line in his other films, when it comes to 9/11 and other historical hoaxes, as well. sublimity wrote: The Judd Apatow produced comedy, "The Five-Year Engagement", includes some blatant 9/11 reminders. 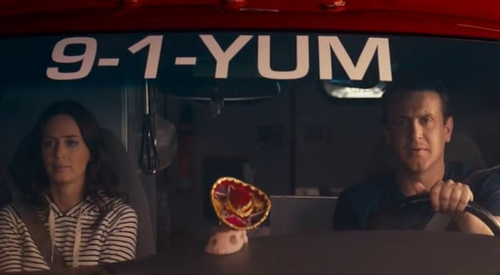 In one part, the main character opens up a taco shop called "9-1-YUM" run out of an ambulance. In another scene, a psychology professor is lecturing students on making bad decisions, then triggers a fake fire alarm, convincing the students to stay so he can prove his point. Firefighters are shown running up the stairwell behind the students, when it is revealed that "the firemen are not real, they are actors". A character is trying to book a location for a wedding reception, but is told that her preferred spot is booked for three years, "unless you want to get married on September eleven". Judd really Apa-tows the line in his other films, when it comes to 9/11 and other historical hoaxes, as well. Well done. A great example of contributing positive work that moves the forum forward! Please keep it up. Louis C.K., a comedian who has his own show on American television, titled "Louie", has had numerous 9/11 reminders -- most of which are pretty in-your-face. 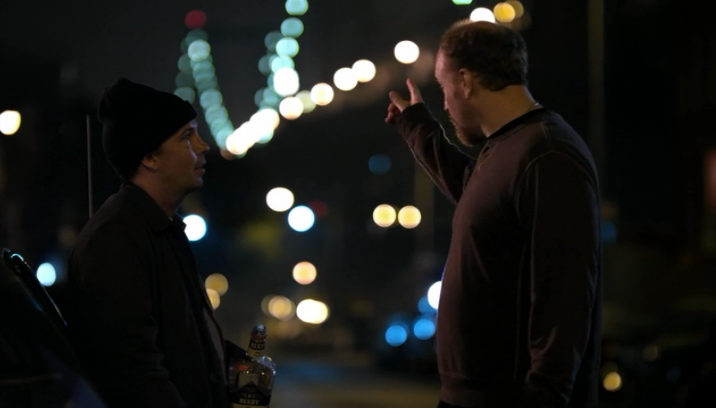 In the below screenshot I pulled from an episode, comedian Doug Stanhope (Alex Jones shill crew) and the aforementioned main character stand in Brooklyn talking about the past, when Louie says, "The twin towers were right over there. Me and my ex wife, we stood there and we watched them burn." Doug replies, "did you just let them burn? C'mon, help 3,000 brothers out." 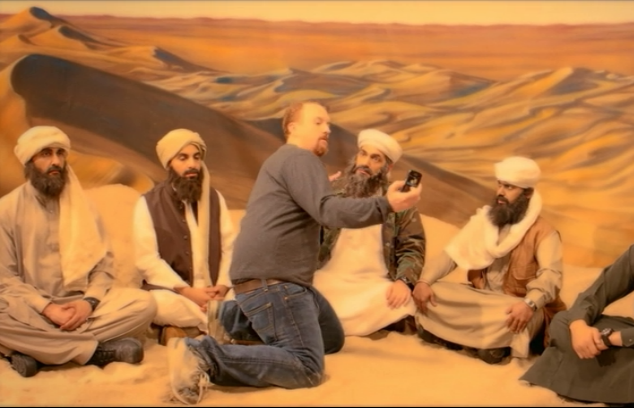 In another episode, there is a dream sequence that features Louie in the desert talking with Osama Bin Laden about why he would do such a horrible thing. Of course, he tells a vague muslim parable about the "victims in the towers" being fruit to be shucked away. Louie even gets his picture taken with Osama. How cute. Not the WTC. However, I caught this scene on tv a few months ago. It's The Three Stooges In Orbit, 1962. Good Heavens. Here we have what appears to be yet some more "9/11-inspired", predictive-programming Hollywood tripe. 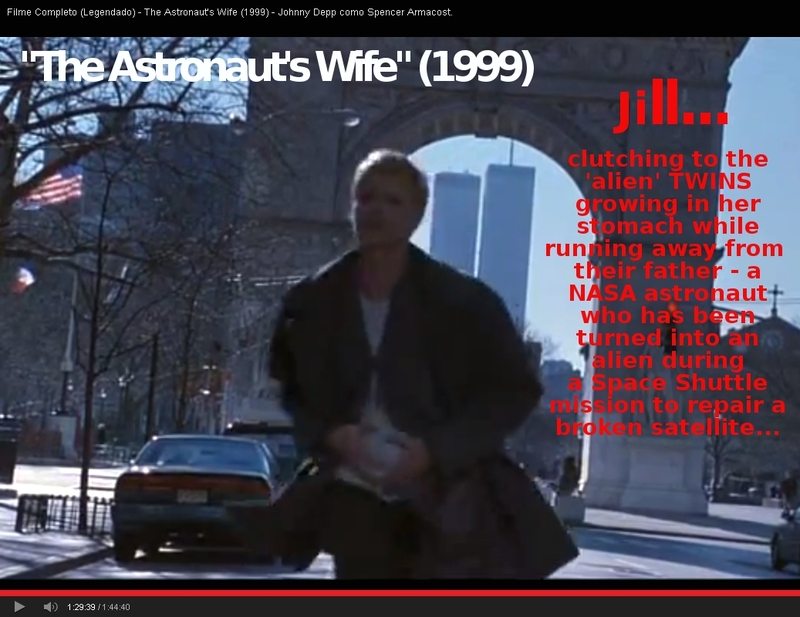 "The Astronaut's Wife" stars Jill (Charlize Theron) and Spencer (Johnny Depp) in a movie script which, in my view, goes to confirm my long-held contention that the ongoing NASA hoaxes are intimately related to the 9/11 hoax. Its jewish writer/director and current NBC television sitcom-producer Rand Ravich may well be another dude worth interrogating one fine day - in relation to his possible insider-foreknowledge of the wretched 9/11 psyop. Oh well, I might be jumping the gun here, unduly accusing this Ravich chap of sinister complicity. So let us just have a look at this movie, ok? All you need to know - before we proceed - is that this movie's storyline revolves around a NASA astronaut, "Spencer", who returns (with his colleague) from a Space Shuttle mission to repair a faulty satellite. During the mission, NASA mysteriously loses contact with the two astronauts - for two minutes - during which (as is clearly implied) they have a close encounter with aliens. The two astronauts are thus turned into aliens themselves - and when they get back home and copulate with their wives, the two women get pregnant with...TWINS ! But here's my favorite part of the movie. Why favorite? Well, those familiar with my electronic jamming theory will understand why. "The modern battlefield is ALL electronic, and the fighter that this man has helped us design, can detect, sort, identify and eliminate ANYTHING electronic." "The modern battlefield is a blizzard, a transparent electronic blizzard, with PLANES, AND TANKS AND COMPUTERS AND MISSILES, all humming away, and into that storm flies our fighter ... doesn't drop bombs, doesn't shoot missiles, just sends out a signal. It's like the voice of God. JUST A SIGNAL, THAT TURNS EVERYTHING OFF." So, the very star of this movie, SPENCER (Johnny Depp), is presented as the developer of a fighter jet capable of emitting a signal which turns every electronic device off? Interesting, isn't it? that this movie was released on "9/11/2012" - and sells the DVD for "$11,27" ??? upstream wrote: Tom Hanks is an interesting character in this media fakery game. Extremely Loud and Incredibly Close wasn't Tom Hanks first film involvement with the WTC towers either. He played a WTC jumper in the 80s. In Mazes and Monsters he plays a deranged youth living in a hallucinatory fantasy world, who is about to jump off one of the towers, until the "Maze Master" shows up and tells him "its a trap". He doesn't believe this and still wants to jump until the Maze Master says he has absolute authority over the game. Then he stops, and goes off to live in his fantasy world, in some psych ward. He never overcomes his illusory reality. That link now returns an error. Perhaps Simon has his own personal virtual valet now, who tidies up any troublesome links that he might stumble upon and find worthy of mention. "The Astronauts Wife" ... "The Astronauts Wife" ... hmmm ... now, why does that sound familiar ????? There have been quite a few movies recently suggesting hints to another 9/11ish type event. What I noticed in the trailer were the 911 calls in the beginning... you hear the calls switch between each side then in stereo you hear what possibly might be a 911 call from 9/11. I remember hearing this in 102 Minutes that Changed America released in 2008 (Which features audio from the FOX 9/11 broadcast.. unavailable to the public until 2011) I didn't hear it in the actual movie though. Also in the movie there are fake memorial websites and articles shown. Also I remember posting 2 comments on this trailer about the fact of the 9/11 call in the trailer a month ago and tried looking for it today, couldn't find it and when I looked for author withheld, the last one was 2 weeks ago. Die Hard /A Good Day to Die Hard, the new one. Featured the same type of scene where outside you just see debris and smoke everywhere like in the 3rd one - The Incredible Burt Wonderstone. There's a scene where Steve Carell gets out of car to walk toward a building, then it collapses in a similar way the towers did. Then finally DREDD 3D (2012) - The behind the scenes of it really caught my attention. At around 1:20 it goes into how they simulated a falling person but it doesnt stop there. At around 1:38 you see a CGI falling person and what looks to be WORLD TRADE Center in the background. You know what I find interesting. I remember being told in a video and by many conspiracy theorists online that 6 months before 9/11 they held the plane getting shot down law and it seems to be happening again this year in a different way. I've been watching Conan lately and found some interesting things. Well, so much for Conan. Pretty shilly stuff he's up to.